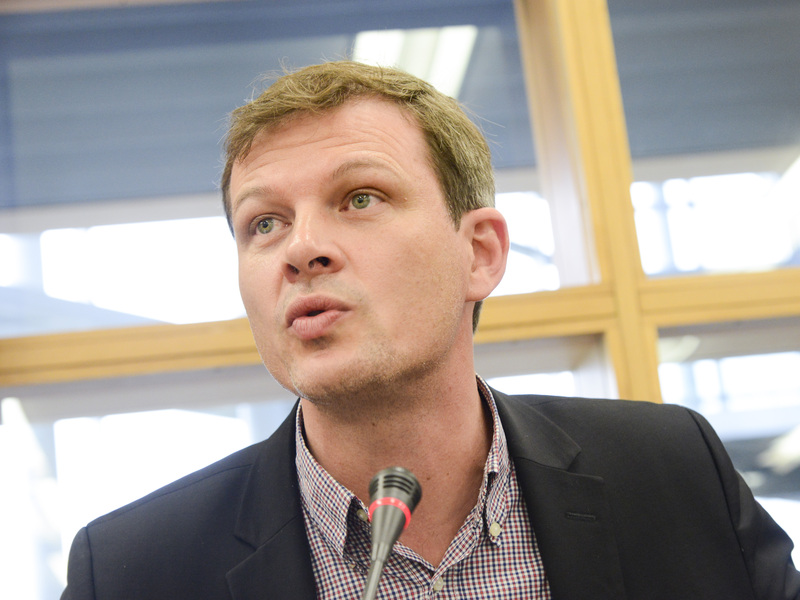 Guillaume Balas is a French Socialist MEP, and the spokesperson for the left-wing movement, Un monde d’avance. Balas spoke to Aline Robert, the Editor-in-Chief of EURACTIV France. What do you think of the Juncker Commission after its first year in office? There is a joke going round in the European left at the moment. “I don’t know if I should support the grand coalition or not – but either way it makes no difference.” The Commission is doing nothing! It has submitted only one fifth as many legislative proposals as the previous Commission in one year… and not on the subjects that interest the socialists. We have a great deal of trouble raising the sectoral issues that interest the Social Democrats. The questions of transport and security are approached from an economic, not a social angle. Whenever the Commission deals with them, it is always from the perspective of the internal market, but never citizen protection. So this achieves nothing. In terms of the environment, we have nothing but the new Circular Economy Directive. We also have a Commission that is keen to validate GMOs, and when we object in the European Parliament, the Commission doesn’t care. That is no way to work. Can the executive’s attitude be explained by the current multitude of crises? On the question of democracy, is the EU stable enough? Poland is increasing the “Orbanisation” of Eastern Europe. Yet there is another country, Greece, which is drowning in debt, and which has asked for help. And that is the country we choose to crush. It’s all symptomatic: on the question of democracy, the EU is weak and complacent. But as soon as we question the interests of the euro, the German budget or the internal market, the EU is ruthless. Yes, but not for economic reasons. We have an army that can be deployed anywhere in the world; something most European countries cannot say today. They were quite explicit about this: there was no choice, France is the only EU country that intervenes in foreign crisis zones. But the economic dogma is still intact. Economic growth in the EU has slowed more than anywhere else over the last 15 years, poverty is rising, and that is not called into question. This poses a real problem. But we have a French, Socialist Economic Affairs Commissioner, Pierre Moscovici. Is he really a French socialist? I’m simply asking. He must be trying to fight from within the Commission, at a least a bit. But what is the point of trying to do it from within a Commission where he is in a tiny minority? Once again that raises the question: what is the point of a coalition, if not to weaken the left? In Germany, the SPD will finish with an electoral score of 15%… that is where a coalition gets you. Is the European left thinking of leaving the coalition in the European Parliament? No, but resistance to the coalition is growing within the European Parliament. The left is not in a good place. It is riddled with contradictory movements and it risks losing credibility in this coalition. So the Commission will have to make some kind of compromise. In the Party of European Socialists (PES) there is also a problem. Our president is still the Bulgarian Sergei Stanishev, who is hardly the embodiment of the left’s democratic ideals. He strongly opposed the exclusion of Roberto Fico from the PES, even after the Slovakian prime minister filed a complaint against the EU over the distribution of refugees. It is very serious and very worrying for Europe that political organs are willing to tolerate such things. You were the rapporteur on combatting social dumping in Europe, which will be discussed in the Employment committee at the end of January. Does the Posted Workers Directive need reviewing? This directive was made in 1996 and revised in 2014. Today there are two possible courses of action: launch a targeted review of the directive, or do nothing. Some believe that we should wait until the 2014 directive has been fully transposed into law. But we already understand its shortcomings. The Employment Commissioner, Marianne Thyssen, told us it needed reviewing, and I agree: the stakes are just too high. The legal application of the 1996 directive could be broadened to say that “the EU shall complete the social actions of the member states”. It is important to boost its legal strength, for example when legislation is challenged in the Court of Justice. The second problem is the difference in levels of social contributions from one country to another. That is where the dumping aspect is found. Finally, many elements of the implementation of the directive could be changed. The forms have been harmonised, yes, but details of what constitutes fraud and the inspection standards, which vary greatly both in number and in character, have not. Should checks be stepped up? In France, the government has strengthened its checks considerably, and very recently. The inspection of labour has been reformed, with improved cooperation. The number of checks in certain sectors has also been increased, particularly in construction and road-building. What I proposed in my report was the creation of a European agency, not for the inspection of work, but based on the model of the competition authority: a small group of high-level civil servants who can understand the rights and languages of the different countries. That would have a significant dissuasive effect. In what sectors do the main problems arise? Transport is the main problem. In maritime transport, for example, there is absolutely no social legislation. It is easy to see where Europe performs at its worst, particularly with ships flying foreign flags. So I propose we draw inspiration from the American legislation, which is very strong on the subject. The second point is air transport. Airlines are severely under-regulated. Pilots accrue debt to pay for their training, and then they are forced to accept all the conditions imposed upon them by the airlines that employ them. The European sky has been turned into a low-cost haven: social standards have collapsed for pilots and crew. Sometimes the personnel are forced to sleep in the containers at the end of the runway. That is how far it has got. The minimum social standards are no longer respected. It is the same story for the personnel on the ground. Their working conditions have also deteriorated severely. Should we enforce a minimum wage for professions exposed to social dumping? The question of a minimum wage is difficult to address. We could introduce a salary tied to the average wage, for example. But certain sectors demand a minimum wage, and that is really delicate. Those countries with higher standards, like Sweden, fear such legislation would drag them down, so they prefer to keep this as a local issue. Transport companies tend to be in favour of common regulations. The lorry drivers’ and employers’ unions have common claims platforms. Many bosses no longer put up with dumping: it distorts their relationships with their employees. Are temporary employment agencies responsible for abusing posted workers? Yes, and in my report I will call for a ban on temporary employment agencies using posted workers. 40 to 60% of worker posting is organised by temporary employment agencies. They are often small companies that disappear quickly. The buyer currently has no responsibility. But in France they are being made responsible: if there is a problem on one of the Bouygues telecom sites, it is now their problem. Do tighter controls solve the problems of social dumping? Today Medef (the French Business Confederation) is crying out that bosses are being given a hard time, so it must be happening. But what is also happening now is that some countries, like France, are taking unilateral measures, but the Commission believes they will distort the internal market. Can the Commission claim competency on social questions that fall under the sovereignty of member states? Yes, because the circumstances demand it. Certain countries have adopted the low cost model for agriculture, using false self-employed contractors. This has really taken off in German agriculture, for example, with drastic consequences for farming in Brittany. In this case, the EU should intervene. We could simply ban the false self-employed status. If the member states agree, it is possible. I know there is pressure to take this kind of contract, but the issue is basically political. As long as we have a right wing majority that puts the internal market before anything else, this will obviously not be possible.